In their last show of the semester, the Kaneko Gallery is featuring the unearthly artwork of Lisa Marasso and Mitra Fabian, displaying their use of traditional and nontraditional materials at ARC until Dec. 15. In their use of traditional and nontraditional materials, the artists utilized glitzy crafts, glitter and other common materials to create their “Unearthly Forms”. Set on large pedestals across the gallery floor, Fabian’s plaster sculptures are reminiscent of pods, allowing viewers to peek inside the glittery, unique forms. In a written statement, Fabian wrote that her plaster forms explore naturalistic forms made from plaster and hydrostone, juxtaposed with materials of glitter, wood and plastic. “I was interested in working with plaster in less traditional sculptural ways; casting it over forms, or letting it set in a seemingly liquid state- evoking the sensation more of a living organism than a heavy construction material,” she wrote. While some of the plaster forms are simply set on pedestals, others are held together by multiple wood pieces. As a sculptor and installation artist, Fabian works exclusively with manufactured materials and remains of the human industry in creating her artwork. Fabian picks out the materials she will use that generate a visceral response to her, attracted by the shape and size of it. The materials are then reconstructed into a new physical form that is more organic as to mimic the appearance of natural patterns, landscape or mold. “These materials often perform as a skin- their translucency captures light and plays tricks on the eye- breathing, swaying or slowly and quietly growing,” Fabian wrote. The material Fabian uses serves as a commentary on the “increasingly modified condition of humans, which pits nature against culture and blurs the line between organic and manufactured”. Marasso, artist and gallery director at Sierra College, contributed to the acrylic panels that hang on the walls of the gallery. Marasso’s two-dimensional works on the walls as well as her installation pieces occupy the space between the positive and the negative. “In this body of work I began to think outside of the function of installation in which I had previously made modular component, and in working on panels found that by developing pieces in clusters, I maintained the flexibility of creating interchangeable parts,” said Marasso. Through exploring the imagery of decorative items through drawing, Marasso releases the subjects and urges the forms to rotate, inverse and layer into abstractions. “I have log been interested in when our most sentimental, personal or domestic embellishments are removed from context and allowed to enter the realm of the gallery,” Marasso wrote in her biography. Marasso explores the visual elements through the relationship of glitzy craft store materials, areas left simple and unaddressed and areas erased to be left silent. “I think it’s really interesting, the contrast between this show and the last show; even though they were both abstracts, they are very different,” said Shara Poole, who was running the gallery. A reception will be held on Thursday, December 1 at 5 p.m. to give art students and observers a chance to meet the artists, ask questions about their work and enjoy treats from the Oak Cafe. 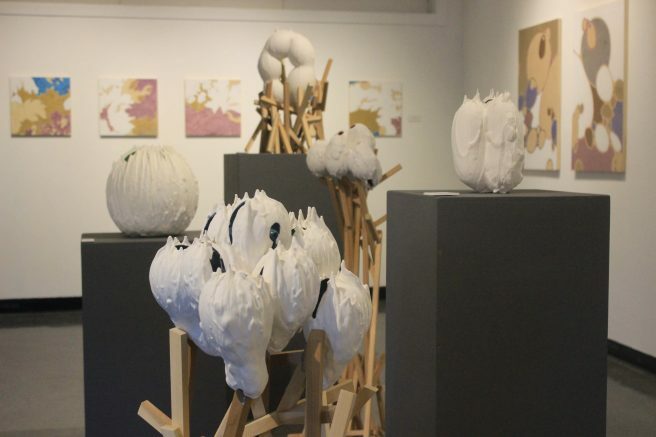 “Unearthly Forms” is the last show of the semester in the Kaneko Gallery. The art pieces will be displayed from Nov. 17 through Dec. 15. Regular gallery hours are Monday-Thursday, 11 a.m. to 4 p.m. and Fridays 11 a.m. to 2 p.m.
Be the first to comment on "Last gallery show displays “Unearthly Forms”"